We always need a little push. Reassurance may be, but we always tend to look outside regarding our opinions, experiences etc. Likewise we all know how Pakistan is blessed with so much scenic beauty, yet we wait for someone else to tell us and we rejoice only after that. We friends were long planning for a trip up north for quite sometime. And this time around, thanks to an old friend who was visiting from USA after three years, we finally agreed to visit Pir Chinasi. Break from Corporate slavery is always refreshing, so we enjoyed a lot. Journey, the gossips, catching up on each others lives, reliving memories etc. Pir Chinasi is peak of the mountain some 9300 Ft high above sea level and once you reach up you realize this looking downwards at the neighboring mountains. There aren’t any hangout places on the hill top, just a shrine of a Pir Sahab. We reached around 30 minutes before sunset. It wasn’t winters yet we had to go from T-shirts to warm hoodies in like 5 minutes. The chilly wind was blowing passing through neighboring mountains producing muffled sounds. View from the top is just fantastic. Here are few pictures. 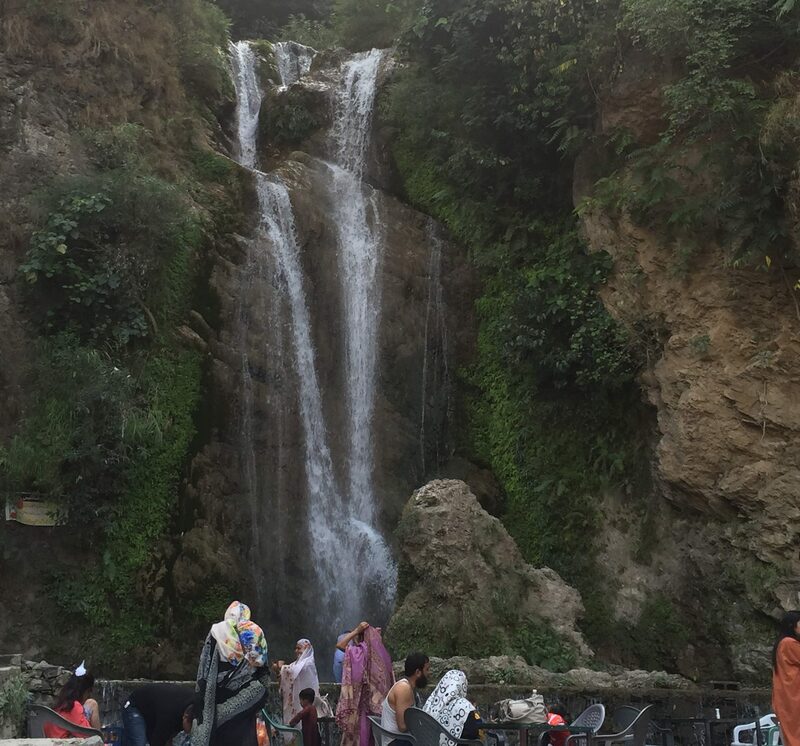 There’s this “aabshar” (our local Niagra falls) spot somewhere on way to Muzaffarabad from Kohala across river Jhelum was truly a great experience. This manual lift is only way to cross the river and go across to enjoy, it’s quite economical like 50 rupees only for round trip. The ride though is quite scary but totally worth it. Roads are in good condition. Just that they are expanding it so construction machinery and rubble. Also it’s a steep track so your car should be dependable and an expert driver would comfortably take it up the hill. 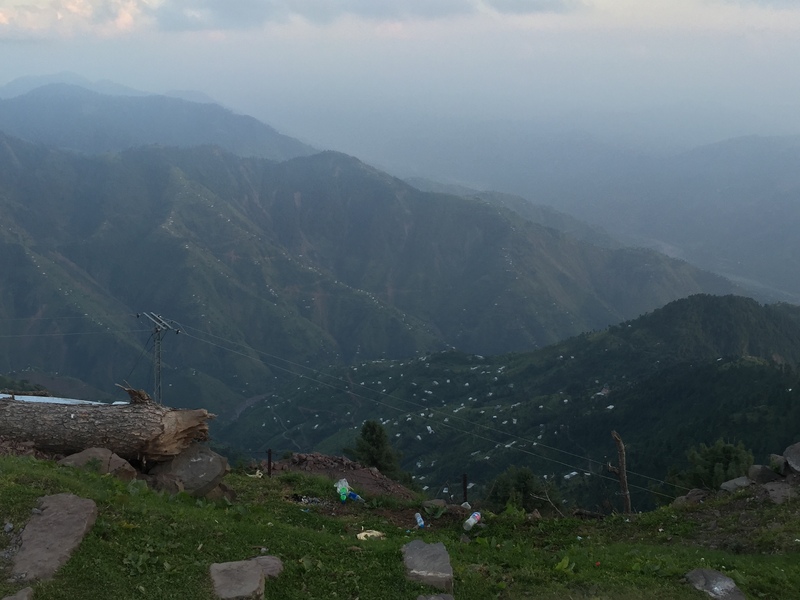 We stayed at a local yet neat, clean and decent accommodation – Mir Continental which was hardly 30-40 mins drive from Muzaffarabad city (it’s like half-way from Muzaffarabad to Pir Chinasi top). We also visited this spot on Srinagar road besides River Jhelum with cute little huts. Overall it was a wonderful, amazing and refreshing for us. Don’t, ever plan a nighter ahead of any such trip. We were scheduled to leave around 6am but thanks to that night-out plan we left after 10:30. Big shoutout to Sajjad Bhai (our van driver) for patiently waiting in his van for like 3-4 hours in our office parking. Always book a van for trips. A – Everyone get to enjoy the journey together cracking jokes and not constantly look at the road. B – Expert driver who knows his job better. Many people have nausea issues while travelling to high altitudes – someone told us instead of taking medicines, try “imli” and guess what, it works! Reblogged this on Insight on Kashmir.